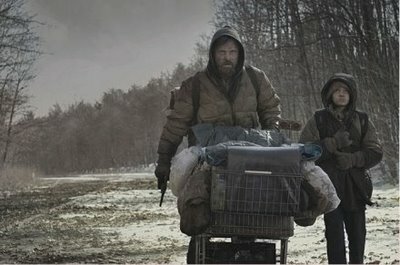 John Hillcoat’s The Road, an adaptation of Cormac McCarthy’s novel, at least vaguely suggests how it arrived at its dank, depressing, rainy, barren, wasteland of a future. It’s never stated outright, but the implication is massive earthquakes caused the desolate landscape, free from animals and agriculture and drenched in necessary cannibalism. Whether nuclear war caused the earthquakes is anyone’s guess, but that’s why referring to The Road as post-apocalyptic would most likely be correct. 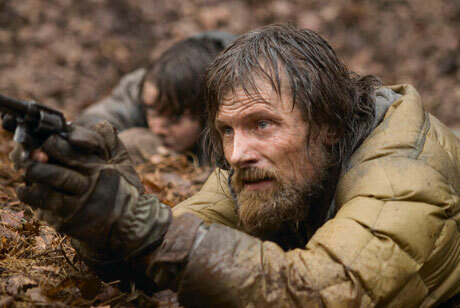 This vagueness and confusion is the overriding emotion at work within the film, as an unnamed man (Viggo Mortensen) and his son (Kodi Smit-McPhee) fend for themselves amidst constant threats by violence and scavengers. McCarthy’s novel No Country For Old Men also played with the constant feeling of uncertainty, but it certainly wasn’t as oppressive and depressing as The Road. Hillcoat’s adaptation is simply a standard feel-bad movie, it’s not illuminating, entertaining, and the repetitive run and hide, then attack, then run and hide again, and then stumble upon possible shelter and food structure, has far more in common with a video game than was probably intended. Mortensen and Smit-McPhee are fine considering what they are given to do, look sad and scared, and make sure not to say anything remotely interesting or free from clichés. The Road plays like a 2 hour variation on the same idea, that as stated in the dialogue it’s “foolish to ask for luxuries.” Each scene is nearly identical to the previous one, grim and trying to prove how the characters have to face self-preservation through unnecessary odds. As a movie, it’s really just punishment, relentless without purpose, and a big step down from Hillcoat’s visceral and thrilling western The Proposition. It isn’t that Hillcoat has necessarily done anything wrong; the casting is excellent (Smit-McPhee looks exactly like his screen mother Charlize Theron), there are a few haunting images, such as when Theron deliberately commits suicide by walking into the unknown darkness of fire and destruction rather than struggle through another moment (“every day is a lie”), and you’ll certainly leave the theater in a worse mood than you entered with. 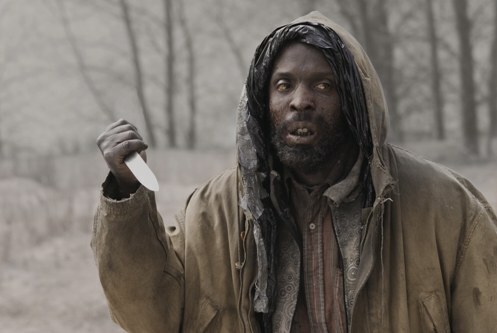 But it’s never clear why the movie needed to be made, unless Hillcoat wanted to show that he could compete with Bela Tarr’s 7 ½ hour Satantango by having just as many endless shots of downtrodden people walking down a dirt road. There is a way to make an engaging film in this style, Gus Van Sant’s post-apocalyptic black comedy Gerry is very funny, and consists primarily of shots of nature and its two characters (both named Gerry, played by Matt Damon and Casey Affleck) screaming idiotic and panicky things at each other. There are glimmers of Gerry in The Road, but no humor or outlet for the endless pain on display. There are audiences for this sort of film, someone has to look forward to and sit through Oscar-bait and/or Holocaust movies that tell us, as if for the first time, that the Holocaust was unpleasant. And for those who thought last year’s “man is an uncontrollable violent animal” parable, Fernando Meirelles’ Blindness was too uplifting, The Road is for you. 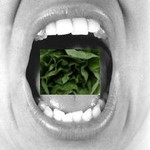 This entry was posted on Wednesday, November 25th, 2009 at 1:11 am	and is filed under Sci-Fi. You can follow any responses to this entry through the RSS 2.0 feed. You can leave a response, or trackback from your own site.